Silas -- My Birthday Buddy! I should preface Silas’s birth story by saying that my daughter Rowan’s birth was 4 hours from start to finish. My water broke the night before, and once contractions started, it was a freight train to the beautiful finish. She was born at home, in the tub, just like we wanted. 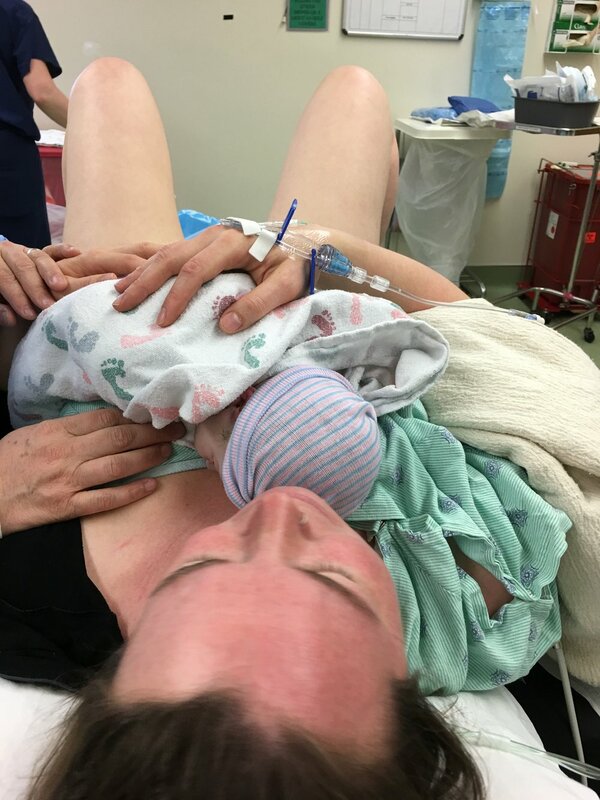 I believe strongly in home birth, and my assumption was that I’d have a fast and straightforward labor with our baby boy too, but that’s not exactly what happened. I didn't feel any contractions until the start of those four hours with Rowan, so when I started feeling them the week before my due date with Silas, I was honestly a little confused. I wasn't sure if they were real, or if I should ignore them. They came and went, and we kept waiting. Then on Thursday night, January 28th, the contractions stuck around. They were consistently 6 minutes apart while my husband put Rowan to bed, and kept coming. I texted Maria around 9:30pm to let her know that I was feeling rhythmic contractions, but they were still very mild, and I was going to try to sleep for a bit. I slept until around 1:30am, when the contractions got a bit stronger. They were completely manageable, and I didn't bother waking my husband, but I couldn't sleep through them either. I sat on the ball and watched Orange is the New Black, and timed each contraction. They were in the 4-5 minute range fairly consistently until around 4:30am. At that point, I woke Chris up, and let him know they were getting stronger, and that we'd need to call Maria soon. Since my first labor was so quick, she wanted us to let her know early - she'd rather nap on our couch than miss his birth. We waited for a few more contractions, and they were definitely stronger, about 4 minutes apart. So Chris called Maria, and I texted our friends and Rowan's babysitter, Alex, giving them a heads up that we'd need their help soon. Maria got to our house quickly, and started setting up. I came downstairs to get some Recharge to drink, and ended up staying downstairs. My contractions seemed to slow a bit as we discussed the day, and I got back on the ball to get them going again. Maria checked Silas's heartbeat, and it decelerated during the contraction. Decelerations aren’t always a big deal, but it was early in the labor for that to be happening. So Maria asked to check me, and I was only 4-5cm, which was honestly a bit disappointing. I had assumed things would move as quickly as they did last time, and even though I was still very lucid, I thought I’d be farther along. Maria said that because it was still so early, we needed to monitor Silas closely, and we may need to transfer. She also confirmed that I wouldn't be able to birth him in the tub, as she'd want to give him special attention after birth to make sure he was doing well. So Chris stopped frantically trying to get the water in the tub hot enough for us to get in. We also decided to try other positions, to see if Silas liked them better. We tried side lying, the birth stool, and hands and knees, but nothing seemed to alleviate the decelerations. The only position that worked for both of us was standing in the doorway (of course it had to be standing) between our living and dining rooms. So I labored standing for a couple of hours. Rowan came downstairs, and Chris reminded her of our previous conversations around mamma being in labor, and what it would be like when baby brother was born. She was completely unfazed, and requested granola for breakfast. Alex showed up shortly after and took her to school, as conversations about transferring were continuing, and we didn’t feel it would be wise to keep her home. Maria checked in with me, as Silas's heart rate was still decelerating during contractions, and my labor wasn't barreling toward the finish like we had expected. I said I wanted to try laboring at home for a bit longer, as it felt like we were making some progress. Maria said that after my water broke, she expected things to move much more quickly. She checked me again, and I was 8, maybe 9cm. I sat on the birth stool and tried my best to break my water. When it finally broke, it was like a water balloon breaking open. I hadn't had that sensation, that gush of fluid, with my daughter, so it was a totally new and surreal experience. It felt like a positive sign. I got back up off the birth stool and started laboring in the doorway again, as his heart rate was better there. I felt like I needed to push. But not urgently, not like the sensation I had with Rowan. It was faint, and I was searching for it. Maria checked me and I was fully dilated, ready to push. But the urge just wasn't overwhelming, wasn't all consuming, wasn't demanding. I got back on the birth stool to see if we could really harness the need to push, and then we tried side lying again, and then I tried squatting in the doorway. But nothing seemed to work. I remember telling Maria that I didn't feel like I was making any progress, that my attempts at pushing weren't bringing him down. She was still monitoring his heartbeat, and during the next contraction, his heart rate dipped lower than it had previously, and stayed down. Maria and Michelle made eye contact, and Chris knew we were headed to the hospital. And Maria said we needed to transfer, now. She put a nasal oxygen mask on me, and we headed for the door. We weren't moving as quickly as she wanted, so she told us we needed to move faster, and we did. We got into Maria's car, with me lying across the back seat, head in Chris's lap, oxygen tank by my side. I'm still amazed I left the house with pajamas and slippers on. From the decision to transfer to us being in the car was 40 seconds. Michelle called St. Luke's hospital as Maria drove, prepping them for us. Maria asked me not to push, which was easy, as my contractions had stopped. For a moment I thought about asking Chris to describe where we were on the road, and how much longer it would take to get there, but instead decided to focus on deep breathing, and getting as much oxygen in me, to Silas, as possible. I thought briefly that we might be heading toward a C-section, and I tried to make peace with that. We arrived at St. Luke's near a side entrance, and went inside. There was a woman standing at the elevators who said that she'd been waiting a long time already, that the elevator was slow. Maria turned to me and asked if I could walk, and I said yes. We walked up two flights of stairs to the Labor and Delivery floor, with the oxygen tank still on, fully dilated. The team at St. Luke's ushered us into an OR immediately, and everyone started putting on those blue paper suits. I remember distinctly slipping off my shoes next to the table, and the nurse asking me to take my pajamas off. I got my pants off, and my shirt about halfway off before they put the gown on top. I got on the table, and the doctor pushed a fetal heart rate monitor into my belly. They found Silas on the monitor, and his heart rate was still low. But he was there. There were so many people in the room: at least one doctor, one midwife, two pediatricians, an anesthesiology team, an IV team, and more than a couple nurses. The IV team started my IV unbelievably quickly, even if a bit roughly, and everyone else started asking questions. Luckily they allowed both Maria and Chris to be in the room, although Chris was relegated to the corner. Maria gave them a history of where we were at, said I was a second time mom, and requested that I be given the opportunity to push. Luckily, Dr. Norrell was open to the idea. I hadn't had a contraction since the one that sent us to the hospital, as I think my body knew it was hurting Silas, and slowed way down. So they tried palpating my uterus to bring on a contraction, which didn't quite work. I was told to tuck my knees into my chest, and hold my legs. Maria then told me to push, so I pushed, loudly, a couple of times. I heard Maria saying that we were almost there, almost there... but no baby yet. Dr. Norrell told me very clearly to shut my mouth, and focus my energy down. There were so many hands on me and in me and around me, but Maria was right there next to me, and I focused on her. Maria leaned in and told me I had one more chance to get him out, or they were going to do a C-section. So I focused all of my energy down, and pushed as hard as I could. And between my pushing, and Dr. Norrell’s vacuum, we got him out. Silas Cooper Horvath was born on his due date, January 29, 2016 at 9:15am, 18 minutes after we left our house. I believe he cried when he was born, but I'm not sure exactly when. I'm told he was very pale when he came out, and the doctors cut his cord immediately and took him to the corner to check him out more thoroughly. Chris was with him, but they felt so far away. His APGAR was 8 after a minute, and 9 after two, and they cleaned him and wrapped him, and put him on my chest. I was still flat on my back, and it was really hard to see him, or feel him. We weren't skin to skin. We laid there for a few minutes while I birthed the placenta. Then the team confirmed I didn't need stitches, and generally got us ready to move. A nurse picked up Silas, and more nurses helped me move onto a gurney to go to our room. In our room, the nurses got me cleaned up, and gave us lots of blankets to snuggle and keep warm. I nursed Silas right away, and he latched well, even though he had a non-trivial tongue tie. Maria told the nurses that we wanted to be out in 3 hours, and they were all rock stars in making that happen. 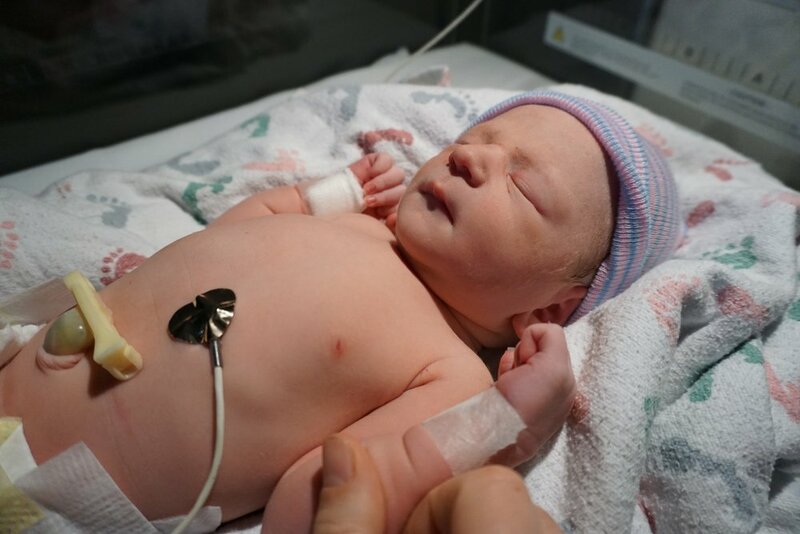 My IV was hooked up to Pitocin, as I had a retained placenta with my daughter, and we decided to use active management this time around (which worked beautifully). We waited for the Pitocin to finish, and when it did, the nurse removed the IV after I confirmed I could pee. Then Maria suggested that I shower, as the better I looked, the better chance we had of getting out of there quickly. So I showered while Chris got our car from home, as we needed the car seat to leave. The pediatrician came by, and he had a pretty terrible bedside manner. He was obviously ignorant of home birth, and was combative when we told him we wanted to leave ASAP. He wasn't forthcoming with information, and was just generally difficult to communicate with. Maria and I both told him that we'd have ample care at home, and he seemed to relent a little bit after Maria described what the next couple of days would bring (her coming by, our doctor coming by the house, etc.). And we finally got out of the pediatrician that Silas's cord blood showed he was in distress during labor, which meant that the pH balance of his blood was a bit acidic. So we needed to wait until they could do another blood test to confirm his pH balance had stabilized before going home. A nurse came down from the nursery to get arterial blood, but she couldn't get blood after digging around in both of his little arms. Eventually they sent us up to the nursery, and another nurse got blood from his vein instead. While we waited for the results, we did everything else - the hearing test, the birth certificate paperwork, the discharge forms... it was a paperwork whirlwind. Finally we got the results of the blood test, and everything was normal. We had to sign an AMA to get Silas out of the hospital with me, but since they were only going to monitor him overnight, we decided it was best for all of us to be home in our own bed, skin to skin and finally bonding. We got in the car around 1:45pm. I looked at Chris and said, "Did that really just happen?!?" It felt so surreal, so foreign. We were home and snuggled into bed by 2pm, and the whole thing just felt like a weird dream. Maria came by that afternoon to check on us, and then went to her birthday dinner, as Maria and Silas share a birthday! Looking back on the experience, I feel incredibly humbled by the power of birth, and so incredibly appreciative of the care we received, both from Maria and the team at St. Luke's. If Maria wasn't there, I would have had a C-section. Her voice, and her support in that room... I don't have words to describe how grateful I am that she was there with us, for her guidance, love, support, and unwavering strength. Silas’s bruise from the vacuum showed he was asynclitic, which means his head was tilted, which can correct itself given time. But we didn’t have time, as the cord was wrapped tightly around him multiple times, and the tighter he was squeezed, the less able he was to get oxygen-rich blood. So that combo is what ultimately sent us to the hospital. Maria suggested that I think of the experience as a positive, beautiful whirlwind, which I know will be easier with time. Somehow, I knew I wouldn't be able to have the home birth I wanted. Since I had a retained placenta with my daughter, I spent time envisioning the placenta being born easily, and I could see that clearly in my mind. I knew it wouldn't be a problem this time around. But I could never see Silas being born in the tub, or being born at home at all. I even had a vision or a dream of having him flat on my back, which I dismissed at the time. His actual birth felt fuzzy to me when I tried to envision it, and now I understand why. I wanted to pull him up to my chest, I wanted to be the one to catch him. I didn't realize how strong that desire was until it was unattainable, until it was all over. I will be processing the grief around not being able to have that moment for a long time. Of course it's all about healthy mamma and healthy baby, and I couldn't be more grateful for the amazing team of people who supported us. But I missed out on the experience I was longing for, the birth I wanted for him, and for me. And that matters. In time, I know I'll find peace with not being able to catch him, peace with his cord being cut before pulsing out, peace with the vacuum, peace with him being away from me after he was born. But for now, I'm allowed to grieve a little, while also giving thanks. Welcome, little Silas. Your entrance was a little more dramatic than we were expecting, but I’m so happy you’re here. You’re perfect. I love you.